LAQ has released a brand new head that I am in love with. Vivien is mature, sophisticated and reminds me a bit of Betty White. If you’ve been dying to have a bento head that looks mature, this is your chance! Like all other LAQ heads, Vivien features motion capture animations and they’re gorgeous. I decided to pair Vivien’s elegance with some vintage items from the 1940s inspired round of Rewind. I’m posing on one of Astralia’s backdrops and wearing a gown by Valentina E. My hair is from Olive and it’s called Lorelai which made me unbelievably happy because, hello Lorelai Gilmore! Anyway, all of these things can be found at Rewind through November 28th. My shoes are new from Gos at the current round of FaMESHed. The Cassie pumps are the first to debut Gos’s new HUDs, which feature three different color packs, including a pack that matches Blueberry’s color palette. To everyone celebrating today, I wish you a lovely Thanksgiving! Thank you for being here with me. I have a confession to make. Whenever I try to do something edgy or punk-like in SL I feel a bit like a poser. I like punk music, but I’m just so not punk in my style in either world, generally speaking. That said, I was feeling a bit rebellious last week and decided to take advantage of that when I was styling this look. My top and bento compatible gloves are both by Fetch and you’ll find them at Rewind. My Catwa applier by [theSkinnery] is also available at Rewind. My pants are from Just Because, who is a guest at Collabor88’s birthday round. Wearing red and purple together was something I did in the 80s when I was a tween and it made my family crazy because they said they didn’t match. Not long after it became trendy to wear those colors together, which helped shut them up a bit. But I didn’t care. I did my own thing, so in that sense I was always a rebel! My adorable bow pumps are from Ingenue, also at Collabor88. The look paired nicely with the Anxiety %ugh! scene currently available at N21 for just L$90. This is a new-to-me store and I love this prop scene. This type of product is great for shooting blog posts when you don’t have the time to set up a compatible scene or find a good location. My pose is by Elephante Poses, and is another Rewind release. Here’s a close up that shows off my adorable belly ring (rigged!!!) 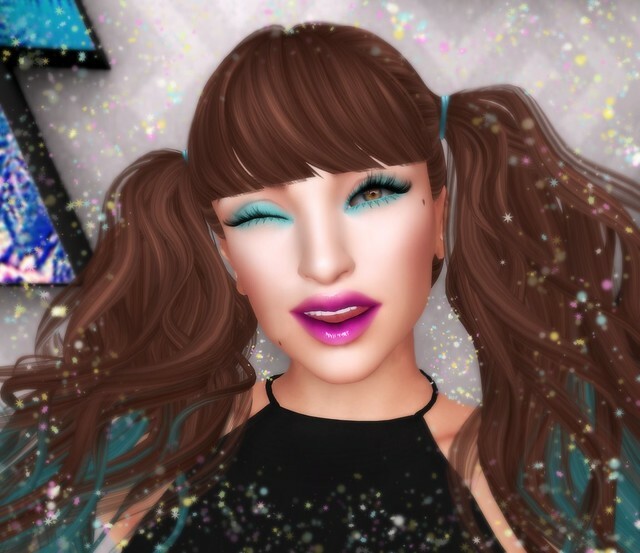 from Maddict that is at Collabor88, as well as this dazzling chrome French manicure from Alme that is available at Whimsical. I have never once used the pointed nails on my Lara body but this manicure and look just seemed to beg for them! Plus, you get a better look at the Fetch gloves. The metal parts and bows are color change. Finally, a closer look at the Chai applier from [theSkinnery]. I really love this applier and I kept thinking that with the shape I made for it my avi resembled Jennifer Lawrence a bit. I am wearing it on the Catwa Koura bento head. I added an eyeshadow from Milla Rasmuson’s Fire collection (which I blended down a bit with the Catwa hud), which is a Cosmetic Fair release. You also get a closer look at my Truth hair, which is the VIP group gift for August. Like all of Truth’s newest releases, Ellie includes a style hud and gives you a ton of options, including bobbie pins (not visible with the style I selected here). Truth’s VIP gifts have been amazing, so if you’re not part of that group it’s definitely one worth the cost of joining! My eyes are from Buzzeri’s Shift collection. When I last checked these hadn’t been added to the Mainstore yet, but hopefully they will be soon (I need more colors!). Cosmetic Fair ends August 31st. Rewind runs through September 10th. The big birthday bash for Collab ends September 6th. Whimsical runs through September 18th. You may have heard the sad news that Blithe has closed. I visited last night to take on final pic. I love printed canvas sneakers, and these floral printed Ulla sneakers from Ingenue won me over as soon as I saw them. They remind me of the Keds I loved so much as a teen. My jean shorts are a recent Mainstore release from Just Because. More stores have been doing Mainstore releases lately, and I have to say I’m finding it refreshing! I love events, but I miss the days of discovering things at a Mainstore, too. Speaking of Mainstore releases, my hair from Exile is another recent one! My cute, strappy tank is from Neve and you can find it at the current round of The Liaison Collaborative. Last month [TheSkinnery] released a new Catwa applier called Lily. I loved it immediately, but it took me ages to get my shape tweaked just right for it. I’m finally thrilled with it, and of course that meant it was picture time! I’m also wearing Catwa eye appliers from [TheSkinnery] which are available at Rewind’s 1980s Roller Rink round. In addition to the Catwa appliers, there are also mesh eyes for those that prefer them. I will truly miss Blithe. Some of my most favorite pics were taken on one of the sims of Blithe, and I am really grateful to Harlow and Jess for their hard work on it. PS. Did you notice my hair is kinda reddish again? I feel like the era of my tweens and early teens (aka late 80s/early 90s) is suddenly super popular again. From the recent debut of the Rewind event, with it’s 90’s theme, to some of the fun color combos at various events (like Uber), it just feels a bit surreal. So maybe it’s not surprising that I found myself feeling a big nostalgic, and that before long said nostalgia led me to listen to Electric Youth, which came out in 1989. This iconic Debbie Gibson album inspired a line of cosmetics and a fragrance, all of which I – naturally – had. See, I was fascinated by Debbie Gibson. She wrote all of the songs on her album, and she also produced six of the ten tracks on the album entirely on her own. It was only with her first album that I had learned a strange lesson… not all singers are songwriters. Up until Out of the Blue got a lot of attention for having been written by a 16 year-old, it never dawned on me that singers didn’t also write their song lyrics or music. This is undoubtedly the result of being a songwriter’s daughter; my dad was in bands my entire childhood, and they wrote everything they did that wasn’t a cover and my dad was the primary lyricist. So it kind of never occurred to me that other people didn’t write their own songs. At any rate, this revelation made Debbie Gibson a hero of mine. I was six years younger than her, but she was doing amazing things. Then she became Eponine in Les Mis (“On My Own” was “my” song; I sang it in 8th grade and related deeply to it), and that just sealed it for me. Debbie Gibson was totally amazing. So, this was my tribute to that time in my life… a skort (!) and chunky plastic ring from Decoy, a cropped t-shirt with the word “dazed” from Tee*Fy at N21, some curly pigtails and blunt bangs, brand new from Truth and available at the current round of Uber. Uber has a brand new layout to help make shopping easier., and a great big bubble of pink gum, thanks to Catwa. Oh, and the perfect 90s-esque photo backdrop courtesy of Mons! I swear I know someone with framed prints that looked like this wall. I just got the Catwa (bento) Kimberly head, as a birthday gift from a dear friend. I chose Kimberly over Catya and Lilo, Catwa’s other two heads (another one, Lona, is either newly out or about to be released) neither of which felt very “me,” even with shape changes. But Kimberly does! It’s very cute and works well with fuller lips and larger eyes. I am featuring some items from the February Powder Pack here. This skin applier is Kelly, from Amara. I wasn’t familiar with Amara but I loved this applier. That’s one of the fun things about these subscription boxes. You get to try out some stores you don’t know! I’m wearing the Powder Pack eyeliner/shadow by DeeTaleZ, which was tintable, so I made it this very 90s teal shade to match my hair. And the lipgloss is from Pink Fuel’s Powder Pack release. My lashes are also from Powder Pack, by Bold & Beauty. I had some trouble adjusting mesh eyes to fit in my Catwa head (and unlike the LeLutka heads, you must use mesh eyes). While Catwa’s heads come with rigged eyes, I wanted more options. Ultimately, the eyes I found easiest to adjust to my shape were from theSkinnery’s Palermo collection. These also have an OMEGA applier version, as well as system eyes. Oh and the adorable moles are another Powder Pack release, from okbye! If you missed the Powder Pack you can buy it later, but please note that the original price is $L1500 and after the price is L$3000 so it’s worth it if you love makeup and skins! Plus, there is going to be a LeLutka version starting later this month… now I just have to figure out which version I want! Gah!